00:28:00 Makes 4 servings, 1-1/2 cups (375 mL) each. Forget take-out! Our Pad Thai recipe has all the flavour of your favourite Thai noodles, but is on the table in less than 30 minutes. Who knew Pad Thai was so easy? Place noodles in bowl. Add enough boiling water to completely cover noodles. Let stand 5 min. Meanwhile, stir-fry chicken, garlic and ginger in 2 Tbsp. dressing in wok or large skillet on high heat 7 to 10 min. or until chicken is done. Add egg and shrimp; stir-fry 5 min. or until shrimp is heated through and egg is set. Drain noodles. Add to wok with remaining dressing and all remaining ingredients; cook 3 min. or until heated through, stirring frequently. 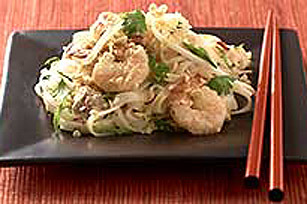 Garnish with chopped peanuts and lime wedges just before serving.